What's the Etiquette for Tipping in Paris and France? What's the Etiquette for Tipping in Paris? 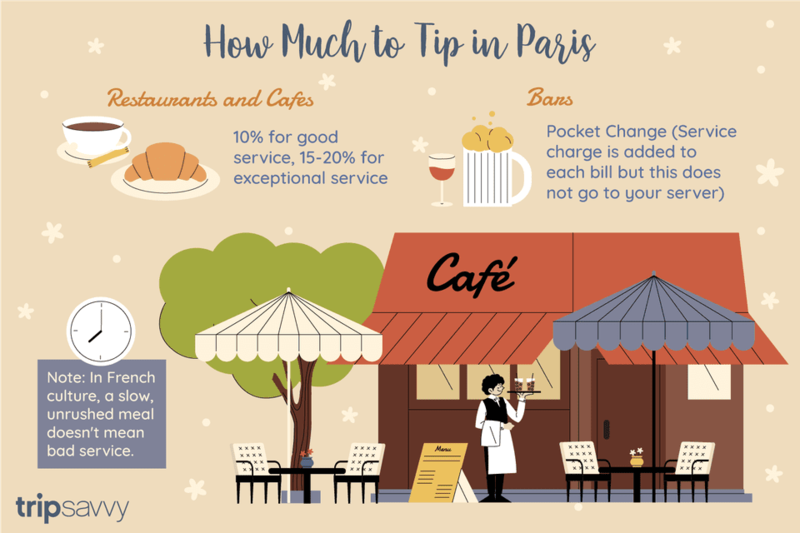 First-time visitors to Paris often wonder how much to tip servers at restaurants, bars, and cafes in the French capital. With the still-relatively weak US and Canadian dollar pinching at most North Americans' travelers' budgets, overtipping can be a worry-- but many people are uncomfortable with tipping as little as Parisians often do. Here are some basic guidelines to help you decide on a reasonable amount to add to your meal or drink, and advice on how to tell the difference between "bad" service and common cultural misunderstandings. First of all, you should be aware that in France, a 15 percent service charge is added automatically to your bill in Parisian cafes and restaurants. One very important point to keep in mind, however: servers in France do not customarily receive this service charge as extra wages. Restaurants may make you think otherwise since the added service charge suggests it, but this is rather misleading. That's why we recommend adding a little extra (around 10 percent) if the service is good, particularly in restaurants. And if you receive remarkable service over the course of your meal, don't hesitate to leave 15 percent. 20 percent would be considered extraordinarily generous in France, even though it's standard to leave that much for excellent service in the US and around North America. What About Tipping for Drinks in Bars and Cafes? In cafes and bars, leaving a small tip (pocket change, essentially) is considered acceptable if you have only one or two drinks. However, if the service is unfriendly or too slow, or for occasions where you drink your coffee or glass of wine at the bar, you can feel free to abstain. Most locals don't leave tips in these instances. What if I Find the Service Rude/Bad/Slow? These sorts of things are entirely left to your discretion, and if you receive what you perceive as rude or subpar service, even in restaurants, you may decide not to leave a tip at all. However, we encourage travelers to remember that what constitutes "rude" service is, to some degree at least, a matter of cultural perception and local norms. Here's why: In Paris and much of the rest of France, speed, attentiveness, and an ability to quickly brief you on your menu choices are considered more important factors in judging good service than wide smiles, personal questions or lots of small talk. Also be aware that servers in Paris will rarely come to ask "how things are going" and will almost never give you the check unless you explicitly ask for it. In French culture, to do so would be rude (a sign they're trying to push you out to let other patrons take your table). One of the most enjoyable parts of dining in France is that you're almost never rushed; you can really enjoy your meal. It's customary for French servers to leave you ample time between courses unless you ask otherwise, and to assume you'll take a while to get through each course. The French custom is to savor the meal, not rush through it. By American standards especially, service can seem quite slow. This does not, however, make it "bad". For these reasons, we advise against lowering your tip if you perceive the service to be "a bit slow", as this has much to do with cultural differences. When in Rome, do as the Romans would. Try to sit back and enjoy the slower pace. If you want to, mention to your server at the beginning of the meal that you have an event to attend at such and such hour, and ask whether the check can be brought to the table as soon as the final course is served.